Embroidered bodice, co. 1610, Courtesy of the Shakespeare Trust. Courtesy of the Shakespeare Birthplace Trust, this embroidered bodice will be featured in Jamestown Settlement’s upcoming special exhibition, “TENACITY: Women in Jamestown and Early Virginia.” This exquisite item is a rare survivor of clothing from the early 17th century, dated to around 1610. The silk and metal threads, as well as metal spangles and sequins, heavily embellish the cream plain weave linen with which it was made, providing a pattern of curling colorful stems and leaves. Although the original material dates to the early 17th century, there is evidence to suggest the garment itself was later reworked. This previous restorative work may have been completed by a later wearer of the bodice, as valuable pieces of material would often be remodeled to keep with the latest fashion innovations. From the embroidery depicted on the bodice, it appears that the original material dates to the early 17th century. At this time needlework on clothing usually displayed botanical and floral motifs, with portrayals of birds, insects, flowers and fruit. This fashion for richly decorated clothing was a new phenomenon. Before the mid-16th century, religious vestments and furnishings had been the main recipients of elaborate decoration, not items of secular fashion. However, after King Henry VIII broke from the Catholic Church in 1534, imagery representing religious scenes came to be considered more controversial in England. Consequently, artisans of needlework focused their attention on “safer” alternative themes. A scene from the “Jamestown” television drama. Courtesy of PBS. Although England underwent a period of religious unrest in the late 16th and early 17th centuries, it was also simultaneously experiencing a time of relative peace and prosperity. As less money was devoted to building defenses and war, the gentry could focus on more pleasurable pursuits. Interest in horticulture increased, and developing an attractive garden became a popular pursuit. A large number of texts were dedicated to the study of botany, and, as explorers returned from their travels to lands such as the New World, people were introduced to new and exotic flora and fauna. These elaborate floral displays in gardens also served to demonstrate man’s newly perceived dominance over nature, as experimentation with plants led to discoveries for new crops and medicines. 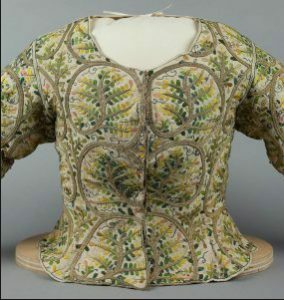 This bodice shows how even embroiderers were inspired by this botanical trend, as they incorporated floral motifs into their patterns for clothing. This fashion was really for the privileged few, and ‘TENACITY’ will illustrate how an item such as this bodice might have been worn by a woman of high status in early Virginia, such as a governor’s wife. 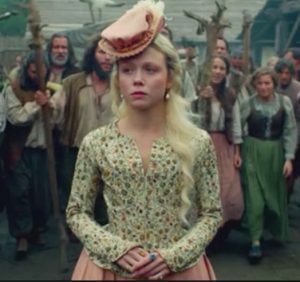 In the PBS “Jamestown” TV series, the character Jocelyn Castell, who is married to a wealthy man occupying the esteemed role of company recorder, represents a woman of such means. In the show, Jocelyn wears a similarly embroidered bodice, embellished with a floral motif. Although accurate in its depiction of the popularity of botanical details, a woman of Jocelyn’s standing would have also worn the bodice alongside other apparel. A lace ruff or collar would have sat at her neck, and lace cuffs would have adorned her wrists. She would also likely have worn a larger amount of jewelry, including a bracelet, necklace and rings. To see the original inspiration for this costume design, visit Jamestown Settlement to explore the ‘TENACITY’ exhibition, where this exceptionally preserved garment will be on display, beginning November 10, 2018.